I once owned a cat who adored watermelon. Any time I would have a slice, he would sidle up next to me and meow for some. The first couple of times he did so, I more-or-less ignored him. I said, "Silly cat! You don't want watermelon! I'll give you some mackerel after I'm done." Finally, perhaps the third time he jumped up on the table and meowed for the watermelon, I said, "Okay, dopey, I'll give you a little piece, but you're going to be disappointed." After that, whenever I had watermelon, I would cut him up a small bowl of it, and he'd dive into it with the sort of fervor usually reserved for female cats in heat. I've never seen another cat with such a taste for watermelon. Speaking of cats, I once tried smoking catnip. This was during my more experimental drug days, as you might imagine. I was temporarily out of the sort of weed I usually smoked, and the catnip was handy. I figured, what the hell; cats seem to have a great time with it, so maybe I'll discover something really excellent and a bargain besides. I rolled a small catnip joint, lit it up, and took a cautious toke. After waiting a minute, and seeing that I didn't die or go into a fit, I took another draw on it. The taste wasn't entirely unpleasant - nor was it something I'd do again just for that aspect of it. I checked all of the usual suspects for signs that something useful might be happening - paranoia; obsession with small details; unfunny things becoming hilarious; the delights of music multiplying exponentially. I came up blank. Nothing. O'Toole's Commentary on Murphy's Law - Murphy was an optimist. ... which has always been my favorite. I recently unearthed a few more. Klink's Theory of Relativity - All tragedy, no matter how horrendous, will eventually become comic material. Ramone's Law of Reduction - Everything can be simplified, and usually to good effect. Moe's Dictum Regarding Free Speech - Just because you're free to say whatever you want, that doesn't mean you won't get a ripsaw dragged across your noggin for having done so. Curly's Corollary to Moe's Dictum - N'yuk! N'yuk! N'yuk! Ow! Fluffy's Valid Observation - There's a reason they call it CATnip, Jim. Hey! Is that watermelon? Yum! Never stand if you can sit. Never sit if you can lie down. If somebody is perfectly happy pulling your wagon, it makes little sense for you to get out and push. And, if you find yourself with the opportunity to take a pee, what are you gonna gain if you don't? Of course, if you ate less watermelon, you wouldn't have to pee so often. 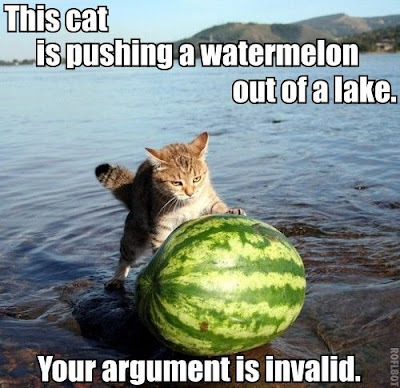 Speaking of Google, if you enter "Cat Watermelon" in a search for images, you will come up with an amazing assortment of photos. Who knew? The one I chose to adorn the top of this page came from Epic Pics Of Win. I would have assumed LOLCATS, but I smoke catnip. What do I know? Soon, with meow better stuff. I have an excellent "smoking catnip" story - but I'm saving it until I can blackmail someone. Yes, that person is really high up in the realm of things...and it's purrfectly (sorry I couldn't resist) true...and I have a witness. One day - maybe. ;) I'm hoping. Oddly enough, I never smoked catnip. . . Nature is a mother. . . Enjoy your watermelon (if the cat will let you have any). . . Loved the no effect in smoking catnip except for craving watermelon. The "meow better stuff"...you should be ashamed of yourself! My favorite rule is the 50/50/90 rule. If you have to make a decision where the odds of making the correct choice are 50/50, you will be wrong 90% of the time. Somewhere among the drek I have saved, and probably moved, I have a two page list of Murphy's laws and corollaries. I could probably get a full year of blogging out of it ...it I was ambitious. I forget where I heard it, but last night someone quoted MUPHRY'S LAW - Anytime you write something criticizing another person's grammar, there will be a typo. The older i get the more i realize no one should ever pass up the opportunity to take a nap or use the facilities. Its never a bad idea to post or re-post something THIS hilarious!!! Thanks a lot!